Traditional Styling combined with the hard wearing practicality of modern fabrics. Stylish, functional and reasonably priced. Collars are made from tough, hardwearing and easy to clean Biothane. The brass dee for the lead is firmly fixed half way along the collar for extra strength. With an additional sliding keeper for extra security. 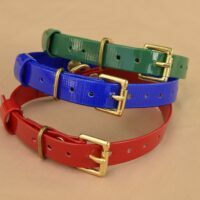 Collar Sizes: Small 9″-13″, Medium 12″-16″cm, Large 15″-19″cm.